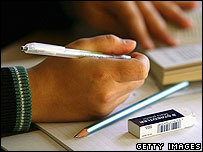 Places at some secondary schools in Brighton are to be allocated by lottery - the first council to do so. The Labour-run authority says the new system will give more children a better chance of getting into popular schools, but some parents are protesting. The main factor will be postcode-based catchment areas, but where schools are over-subscribed a lottery will be used. Elsewhere, some individual schools have allocated a number of places this way, acting independently of their councils. 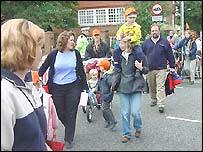 But it is believed to be the first time that a local council in England has formally backed this policy. The government says it is up to local areas to decide on school admissions, as long as they abide by the code of conduct. The code of conduct on school admissions was revised in January and one of the changes was to say that lotteries are permitted as a way of allocating places to over-subscribed schools. The code - for primary and secondary schools in England - is aimed at ensuring fairness and transparency in the allocation of school places. Previously, priority in Brighton and Hove had been given to those who lived closest. Now the city will be divided into six catchment areas and pupils will be expected to go to a school in their area. Where there are two schools in one catchment area, admissions will be decided by lottery, not proximity. The local authority's ruling Labour group got the plans through on the casting vote of the chairwoman of the families and schools committee, Pat Hawkes. She said: "Brighton and Hove is a city of haves and have-nots and the have-nots have been left out." The measures will come into effect from September 2008. In Brighton and Hove hundreds of parents have attended public meetings, a petition has been signed by nearly 4,000 people and tens of thousands of leaflets have been distributed by campaigners. One angry is parent is Tracey-Ann Ross who said her small area of town would be cut off from its traditional catchment area. "We're going to be sent potentially not to our nearest school, which before this we would have got to. "I could now be having to drive my son halfway across the city to his fifth nearest school." And schoolgirl Edie Watson fears putting her name in a hat will only mean she is split up from friends made at primary school. "I don't think I'll be with that many people I know." But other parents believe the new system will prove fairer and will stop popular schools becoming the preserve of a privileged minority who can afford to buy houses nearby. Petra Sumner, who is in favour of the new system, said schools were not evenly distributed throughout the city. "If you live in central Brighton and Hove or east Brighton, there are always going to be people who live nearer to your nearest school. "For example, my son , who's is Year 6, his year group will be sent off to seven different schools this year if last year's anything to go on." The government's new admissions code is intended to make the process fairer by making it harder for schools to select brighter, wealthier pupils by the back door. Ministers believe it would give poorer pupils a better chance of getting into better schools, which are often in wealthier districts. Across England other local authorities are considering their responses to the new admissions code. On Thursday, around 1.2 million parents will learn if they have succeeded in getting their children into the school of their choice. The Daily Telegraph said its research showed 200,000 pupils may miss out on their first choice secondaries this year, with some schools reporting 10 pupils competing for each place. It says around a third of all applicants in some parts of the country will fail to get a preferred place. A spokesperson for the Department for Education and Skills said: "Record investment has delivered more good schools and increased parental choice and through our Education Act we are raising standards and ensuring fair access for parents. "Random allocation is one criteria that schools may use to allocate places at oversubscribed schools to give pupils fair and equal access." Is a lottery for secondary school places a good idea?